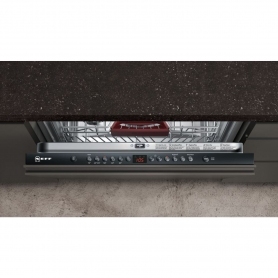 This built-in dishwasher from NEFF will fit into your kitchen units seamlessly. It also comes with a range of fantastic features to get your dinnerware sparkling in no time. The S513M60X2G is even exclusive to Euronics and Agent stores, so you won’t find it anywhere else. 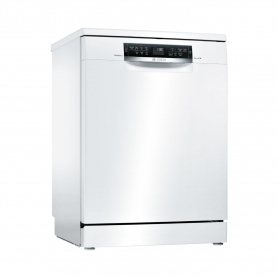 You’ll find plenty of space for all your plates, dishes and cups in this ‘A’ rated dishwasher. 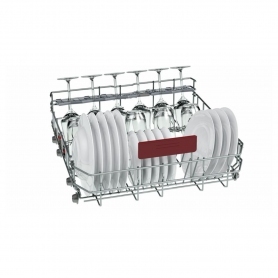 The S513M60X2G comes with 14 place settings, making it perfect for families with larger dishwashing loads. Best of all, it has an A++ energy efficiency rating, which helps to lower your energy bills. By selecting autoProgramme, you’ll get optimum dishwashing results at the touch of a button. Or, to speed things up, varioSpeed Plus washes and dries your load up to three times as quickly. If you’d like your dishes as dry as possible, extraDry uses higher temperatures and extends the drying phase. Not only does the S513M60X2G offer plenty of programmes, but it also has a range of handy features. With NEFF’s rackMatic™ function, you can adjust the height of the top basket in three stages. This makes loading and unloading easier, especially when handling large pots and plates. 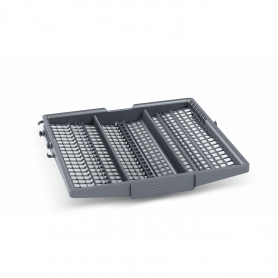 The varioDrawer even offers an additional loading level, providing room for cutlery and small crockery items. 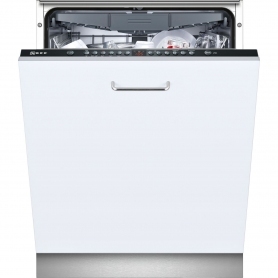 Thanks to Aquastop, this NEFF dishwasher is also protected from leakages. A safety valve prevents it from overflowing, even when the machine is off. And, get top cleaning results with dosageAssist, which releases the full detergent strength to remove any leftover food. Timelight is a stylish and contemporary feature, perfect for modern homes. This projects the remaining cycle time onto the floor, so you’ll know exactly when your cycle will end. Electronic controls and a push-button display make the S513M60X2G easy to operate, while the counter balanced door keeps the appliance open for loading and unloading. 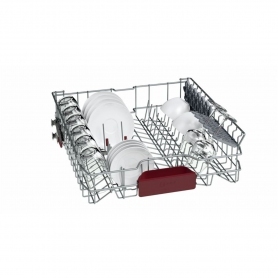 Measuring H81.5 x W59.8 x D55, this NEFF dishwasher is designed to fully integrate into your existing kitchen unit. It’s also made from stainless steel – known for its quality and durability. Looking for a high-quality dishwasher that’s packed with programmes? Then look no further than the S513M60X2G. Add one to your basket today. autoProgramme - Optimum dishwashing results at the touch of a button. varioSpeed Plus - Wash and dry up to three times as fast. extraDry - It uses higher temperatures for the drying process and extends the drying phase for particularly dry dishes. rackMactic - The basket is equipped with special devices at the top. If they are pressed, the height of the top basket can be easily adjusted in three stages. That makes loading and unloading simpler, particularly when dealing with large pots or plates. varioDrawer - The varioDrawer offers an additional loading level. Thanks to its special design it not only provides room for cutlery, but also for ladles, salad servers and even small items of crockery such as espresso cups. And as there is no longer a cutlery basket in the bottom basket, there is now space for a total of 14 standard place settings. Timelight - Timelight projects the remaining time of the cycle on to the floor in front of your machine. Stylish, contemporary and practical, there's no risk of disrupting your wash.
Aquastop - Protects inlet and outlet hoses from leakage. A safety valve prevents any more water from entering the dishwasher and overflowing - even when the machine is off. dosageAssist - Releases the full strength of the detergent.